When inspecting cantaloups it is always necessary to cut a few, looking for internal defects. You may notice some liquid in the seed cavity by lightly shaking the melon. However, melons should be cut to assure that liquid is present in sufficient quantities and that it is not merely loose seeds present. The presence of loose seeds alone is not considered a defect. The USDA does have a scoring guideline to determine when too much liquid is a defect, but unfortunately the person who created this guideline most likely never tried it themselves. The USDA states, “To determine the amount of liquid in the seed cavity, the melon shall be cut through the center with the stem end pointing up, at right angles between the stem scar and the blossom end.” Cutting the melon in half, with one hand while holding the melon in the other hand is impossible. Most inspectors will place the melon on a flat surface, on its side, and begin to cut the melon in half. Rotate the melon with the stem pointing up, on the flat surface, holding the top half of the melon while cutting. Carefully remove the top half. Score liquid in the seed cavity as damage (against the 12% tolerance) when the liquid flows freely from the melon while cutting. I think you get the idea, try to carefully cut the melon in half and determine the amount of liquid in the lower half of the seed cavity. 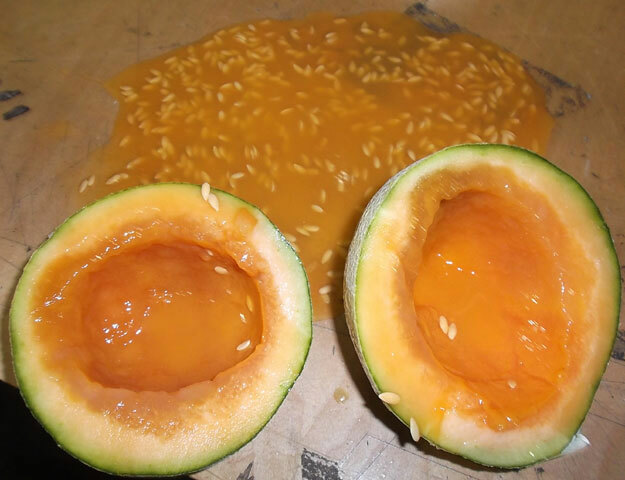 If there is more liquid than can be held in the lower half of the melon, that means it is flowing freely, and should be scored as a defect. Score as serious damage (against the 6% tolerance) when the liquid is fermented, or when the flesh of the cavity wall is noticeably soft, discolored, or fermented. 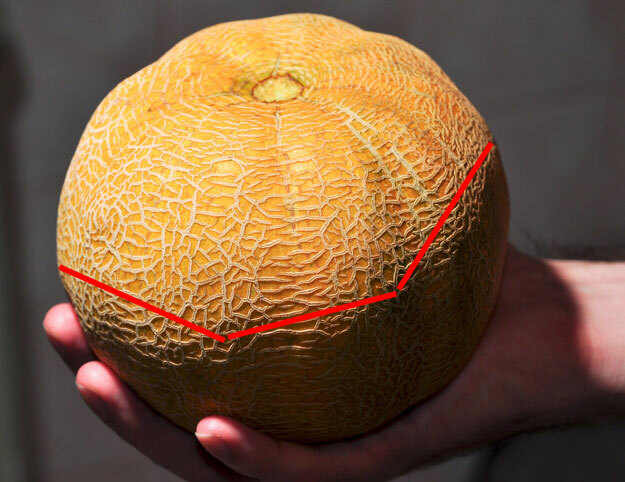 In extreme cases the cavity wall may be breaking down into decay, and if you find the flesh being decayed then the melon would be scored against the 2% decay tolerance. If you found the cantaloup pictured above, you can tell immediately it will be scored as a defect. If the flesh is soft, and is fermented it should be scored as a serious damage defect. It appears the flesh is definitely discolored and probably soft, so this melon would be scored as a serious damage defect. Lastly you must feel the flesh in the cavity to determine if the flesh is breaking down, as decay. This blog is a GREAT resource for myself and my employees. They are easy to understand, and the pictures help to increase our understanding of the defect concept. Thank you!